Families from Maine, New Hampshire, Massachusetts, So. Carolina, Washington, and Florida gathered on September 9, 2017 to celebrate their "Annie-versary" of survival or to remember their loved ones lost to a brain aneurysm. The setting on Back Cove in Portland was perfect for the event hosting over 350 people that enjoyed a sunny day and "shared their tears, remembered with love, and walked and ran to honor." 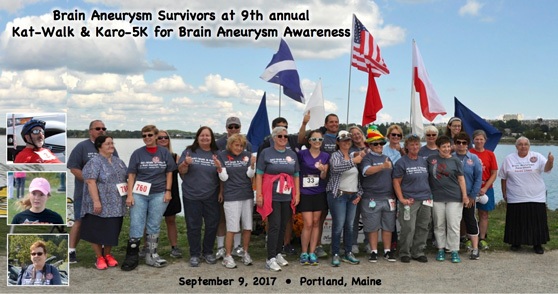 This year saw 25 Brain Aneurysm survivors with their family and friends walk or run. 22 teams were recognized for their fundraising efforts including Team Cheyanne, Team Karolina, Team Bailey, and Team Heely Hikers. Information tents were presented by Maine Brain Aneurysm Awareness, Michael T. Goulet Foundation for Traumatic Brain Injury and the Maine Chapter of the Brain Injury Association of America, Brain Injury Voices, Stroke Program at MMC, and Disability Rights Maine. Face painting for the kids and 50/50 raffle for the adults rounded out the fun. Among the many highlights of the day was the presentation of the “Maine’s 2017 KAT-Walk & Karo-5K Chair of Research” to Anand Rughani, MD from Maine Medical Center. 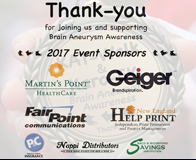 With your help, in excess of $21,000 was raised to benefit our efforts to provide brain aneurysm awareness, education, funding of research, and general support centered on the Brain Aneurysm community in Maine and northern New England. To all the many families that came and participated, either to celebrate their survival or to remember their lost ones – thank-you for joining us and for your continued support in making this a special day for so many in the brain aneurysm community. Freelance photographer Yuki Hall whose mother is a brain aneurysm survivor.